The idea of putting it on display temporarily was a result of the late Bill Menz’s mission to educate future generations of the sacrifices our veterans made for our freedoms. The display, located outside the Children’s Watch room and Cardio Room, is part of the Company F historical panels that County Historian Matt Ballard commissioned a few years ago. 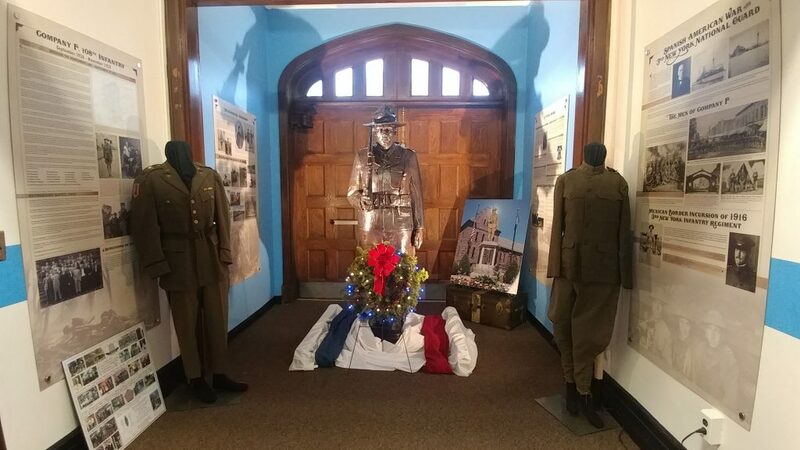 The display allows visitors to get an up close and personal look at this 7′ magnificent work of art, learn the history of the Medina Armory before it became the community activity center and YMCA and even take a selfie (and post #companyfmemorial). The Company F statue is on temporary display at the YMCA in Medina until it’s mounted to the monument in the Spring. The Company F Memorial committee wishes to express it’s deepest appreciation to all those that have supported us to make Bill’s vision a reality. Sculptor Brian Porter and the University of Buffalo’s Foundry Director Chris Siano who created this masterpiece. Brian and Chris were exceptionally accommodating by inviting us to witness it’s evolution. John Brown of Select Collision in Batavia who transported the statue from UB to Medina and lent his trailer for the Parade of Lights for our big reveal. He and set designer Carl Hicks devised and built the means to not only support and secure the 1400# statue to the trailer for the parade, but modified the support for the display at the YMCA. Mike Fuller and the Town of Shelby for providing the crew and necessary equipment to raise the statue from it’s horizontally packaged position to it’s upright position on the float trailer. Lisa Tombari and Talis Equity for providing us a temporary home to store and create the float until we could move it to its permanent location at the YMCA. The Village of Medina Parade of Lights committee for allowing us to lead the parade to introduce the statue to the public and bestowing us with the “Community Spirit Award” for our presentation. Greg Stanton of Stanton signs for providing the beautiful signage for our float and a generator to power our lights in the Parade of Lights. Michael Walsh for assisting us in building the float and engineering the A/V equipment and lights. Cliff Fuller for also lending us his carpentry skills for the float. LeChase Construction for providing us the necessary equipment and operator to move the 1400# statue from the trailer and into the YMCA. Mark Zacher of Zacher Construction for assisting us with an engineering analysis and structural support to insure the YMCA floor could withstand the weight of the statue. The YMCA Board of Directors and Y director Greg Reed for allowing us to display the statue inside the YMCA until it’s installation in the Spring. We would be remiss to not include all of our financial contributors who have made Mr. Menz’s dream a reality. (View them here.) Thank YOU, supporters! And thanks, Bill Menz, for leaving our community this beautiful, moving legacy. We hope we did you proud!